Salads, not simple? Who’d have thought? Prior to Lesson 10, when I thought of making salads, the word “complex” wasn’t usually something that sprung to mind. However, this was a word that stuck with me during this lesson and long after. 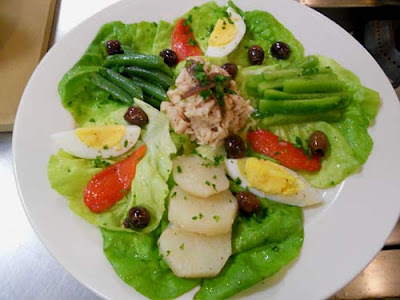 I had visions of Salad Lesson being a leisurely session where we would mix various vinaigrettes, dress some lettuce, and after praising ourselves and our teammates for how perfectly we seasoned the dressing, we would have a few minutes at the end to practice tournage. Not so. Thankfully, following Soup Day which was deceptively difficult and completely kicked our butts, our chef instructor pre-warned us that this lesson was another one that was not as easy as it sounded. The first salad we made was a classic–Niçoise Salad, which is known as a composed salad as it is, (who would have thought), composed of a mixture of several different ingredients put together. Each component was separately dressed with a vinaigrette of olive oil, wine vinegar, garlic, salt, and pepper. The components consisted of a base of lettuce, string beans, tomato, egg, bell pepper, olives, tuna, and anchovies (yum).The final presentation of this salad was beautiful and I was pleasantly surprised when I realized it tasted even better than it looked. So far, so good. Then it was on to the Sweet and Bitter Greens with Tomato and Herbs. This salad consists of several different bitter greens, coated in a vinaigrette and surrounded by wedges of tomato, also lightly coated in the vinaigrette, and fresh herbs, topped with thin slices of toasted baguette. After presenting this to Chef, there came a moment of testing my patience (not a strength, but something I am working on). As much as I wanted to scoff the salad like a ravenous herbivore, as I so often do, Chef suggested we wait for dinner break to add duck confit on top. The duck confit was prepared the last lesson and had been preserving in its own fat for several days—oh yeah! It truly was the pièce de résistance of the dish, or dare I say, the entire lesson. (Sorry, salads.) The classroom was a little more quiet than usual for dinner break—always a good sign that people are totally immersed in their food experience. I never thought I would ever make a salad that consists of about 20 ingredients, but the Cooked Vegetable Salad did it. It was the ultimate recipe for students to practice different techniques and included cutting macedoine (a cut that transforms your vegetables into 1/2-by-1/2 centimeter cubes) and cooking l’anglaise for the vegetable component. It also required us to create an emulsification for the basil mayonnaise and I can always use more practice in all of these things! For the final presentation of this dish we made very fine slices of cucumber using the mandolin. I confess I had images of sliced fingertips, but I am happy to say everyone’s fingers are still intact—for now at least. Once we combined the veggies with the mayo and placed this mixture in a timbale mold (along with the tomato fondue, another component of the recipe that’s simple but SO GOOD), we were ready to present. “A little more salt on the vegetables, otherwise good.” Hey, I’ll take it! Besides allowing my potatoes to come to a rolling boil (busted), this was about as chaotic as Salad Lesson got. As lessons are getting busier and yes, more difficult, I am enjoying them even more. I have learned so much after just a few weeks of the program and despite having a long way to go, what makes the difference is that I actually love learning this stuff. I know that with some passion, practice and persistence I’ll be able to take on any salad that is thrown at me… so to speak. I might as well fess up right now—this writer is not a sports fan. When I go to a game, it’s really just an excuse to load up on all the ballpark snacks. 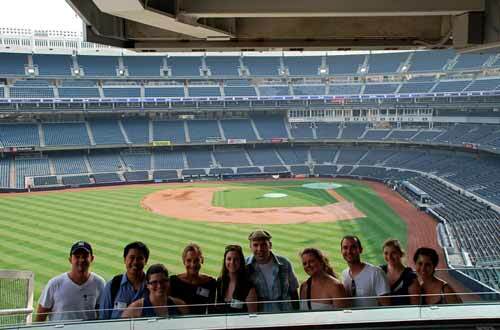 Therefore, the kitchen stadium tour that a small group of us students got to take recently was the perfect way for me to see Yankee stadium. Hot dog and nacho assembly lines were nowhere to be seen on this visit. As much as I love concessions, the kitchens we saw are producing food in a completely different league. Chef Nichole Sutton, of the Legends Club, led us on rare behind-the-scenes tour of the elite clubs and luxury suites that are providing elevated dinning experiences to Yankee fans. However, these kitchens aren’t trying to completely undo themselves of their ballpark concession roots either. According to Chef Nichole, the goal is more to kick it up a few notches, so rather than getting your average hamburger, here you might be served a short rib slider topped with foie gras. You can also expect to find classics like seafood cocktail. They’re taking high-end ingredients and presenting them in accessible and familiar ways. The surroundings are also just a little more luxe than your average bleacher seats. Fans with deep pockets can buy suites, which are basically like a baseball fan’s dream apartment. They include indoor and outdoor seating from which to view the game, big screen TVs, and individual kitchens. However, you’ll never have to lift a finger in this kitchen as the suites receive full-service catering. 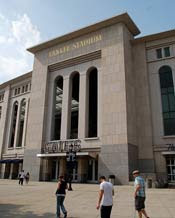 The Yankee Clubs have a more social ambiance at which fans can enjoy restaurant-style dinning within the ballpark. Chef Nichole’s club, Legends, has the look of a chic, modernist cafeteria with a lot of dark woods, black leather, and steel chairs. The bright, airy space is organized around three buffet stations at the center of the club themed around air, land, and sea. Each club has a different vibe, but no matter where you go, you’re surrounded by Yankee history as photographs of team members hang on just about every wall. A lot of these clubs also have amazing views of the field to enjoy as you savor your meal. Most of the clubs require membership; however, the Audi Club does provide reservations on a per game basis. These club areas are quite large and have multiple areas, and Chef Nichole made it clear that to serve so many people each game the kitchens really have to hustle. (Legends alone serves approximately 1,200 people on average.) Moreover, sometimes conditions aren’t exactly ideal as some of the kitchens are rather small given the large production scale. The pastry kitchen in particular felt pretty tight with just our small group and the few staff members that were working during our visit. Every game is a make-it-work situation, and they get it done. Product selection is also given a lot of consideration, as one would assume. As much as possible, the clubs try to source locally and sustainably with an eye on social and environmental responsibility. However, there is a bit of a balancing act that has to happen given the sheer quantities of product required. Additionally, certain items are provided by sponsors, which also factor into purchasing decisions. Besides getting a very different look at stadium eating, our group also got the rare privilege of getting within a few feet of the green. I have to admit that getting a taste of what it might feel like to emerge out of the dugout and step onto the field was pretty cool. When I next return to the stadium, back under the constraints of a student budget, I’ll probably opt once again for my usual concessions. I’ll still enjoy my hot dog as always, but I will definitely be thinking longingly about those sparerib sliders. He does not have a favorite restaurant because he has been to too many to even decide. That is living the dream for anyone who loves food and it is reality for author and food science savant, Harold McGee. McGee has been present in the food circuit since the 1984 release of his book On Food and Cooking: The Science and Lore of the Kitchen. On Food and Cooking bridged the gap between food and the science behind it, during a time when food science was only of interest in a commercial setting. The book brought practicality to curious kitchen chefs and allowed them to understand their cooking on a higher level. After several books and an increasing interest in food science within the food community, he then published a revised version of the book in 2004. On Food and Cooking is a testament of the power of desire and interest. Not coming from a food science background, but rather one based in literature and astronomy, McGee wrote his book following sheer interest and passion for the subject. He was interested in the ideas that were behind science and the science of everyday life. McGee’s interested mind created a new occupation for himself following a teaching position at Yale University. Now McGee has several books under his belt, a book regarding taste in the making, and is a columnist for the New York Times. A few weeks ago, Harold McGee graced the halls of The International Culinary Center of California. Alumni, current students, and a few lucky open house guests were able to meet McGee during a signing for his books. 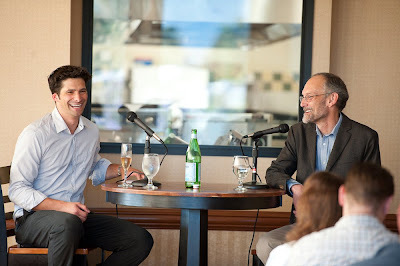 Following the signing, McGee was accompanied by Paolo Luchessi of the San Francisco Chronicle for a question and answer forum. Questions regarding the Spanish and Nordic movements of cooking to the intricacies of sous vide cooking were asked. McGee may not have come from the same kind of background as many students of The International Culinary Center, considering he has never gone to culinary school, nor even studied food during his formal education. However, McGee’s writings on food science have helped to create diversified interests among chefs. 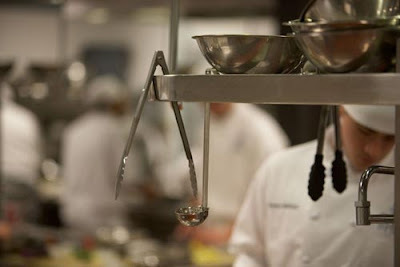 Unlike before, chefs now are knowledgeable not only about the tradition of cooking, but the science behind it as well. McGee’s knowledge and career are highly envied and admired. Being as such, McGee was able to leave The International Culinary Center with words of advice and wisdom for those beginning careers. For writers, he stressed to write about what you like. He also noted that writing in the sciences is not heavily written about. For aspiring cooks, he said find a good place to work at and cook a lot. Great advice from a highly acclaimed food writer. Surely, students will be able to take his words to their own hearts and cooking. Melanie Lopez graduated from the culinary arts program in June 2010. Like McGee, she traded in her scientific scholarly pursuits for other interests that explained the ideas behind everyday life. She is now pursuing a Bachelors Degree in Community and Regional Development at the University of California Davis and expects to graduate in June 2012.